Default time zone – Users can set the default time zone to display date and time in the Appspace instance. Custom website logo – Administrators can customize the Appspace logo with the company or product logo. Background header color – Administrators can customize the Appspace header with a custom brand color. Custom domain – Administrators can set up their own Appspace subdomain or use a custom domain. 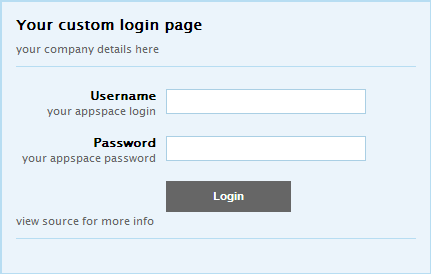 Custom sign in page – Administrators can create a custom login page for Appspace users to sign in. 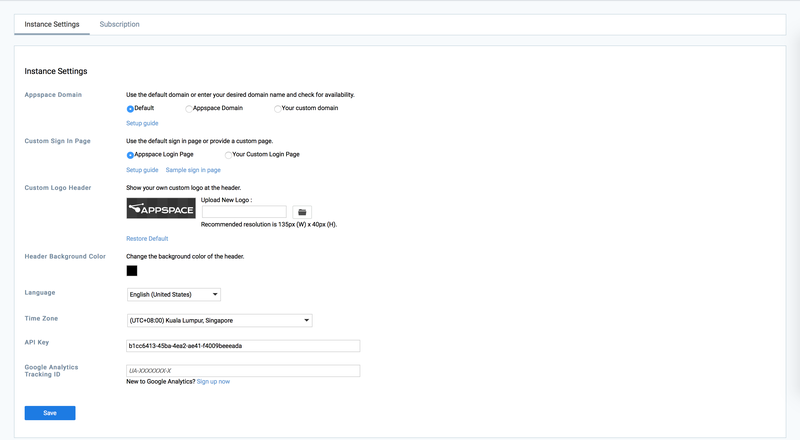 The Instance Settings page allows you to personalize the account for cloud and on-prem instances such as custom logo header, header background color, time zone, API key, and Google Analytics Tracking ID. Appspace Domain - Administrators can set up their own Appspace subdomain or use a custom domain. Custom Sign In Page - Administrators can create a custom login page. Custom Logo Header - Administrators can change the logo in the header to use their own custom company or product logo. Appspace 7 is only available in English, and does not support multiple languages. If you choose any other language, it will default back to English. The Language field in the UI is scheduled to be removed soon. Click Admin > Settings from the Appspace Menu navigation bar, and click the Instance Settings tab. Select the desired time zone from the Time Zone drop-down menu. Click the Custom Logo Header browse button, and select the custom logo image file. The recommended image resolution is 80px (W) x 40px (H). Click the Header Background Color color picker, and select the desired color for the header background. The personalizations below are only available on Appspace on-prem deployments. In the Appspace Domain section, select the desired domain option to be used. Select the Appspace Domain option, and enter in the desired subdomain. Select the Your Custom Domain option, and enter in the custom domain URL. Create a custom sign in page. The login form must post to Appspace login page URL, for e.g. “http://appspace.nexusondemand.com/app/login.aspx”. After the custom login page is created, upload it to your public server. The following is a sample custom login page and the associated HTML code behind it. In the Custom Sign In Page section, select Your Custom Login Page, and enter in the custom login page URL.